Tear the 2 back layers of the serviette off. 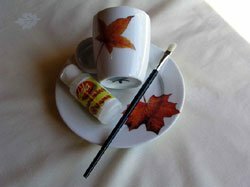 Follow method as with Decoupage and coaster to iron serviette onto coaster and seal on top with Podge. Cut out design with decoupage scissors. Tear applique paper off the back. Wash plate and mug with 50% vinegar water solution to remove all greasiness. Dry. Place design face down on plastic. Paint Ceramics@Home Clear Varnish No. 15 liberally onto the back. Place into position on plate and rub gently with finger with a vinegar cloth from the center outwards to remove all bubbles and creases. Wipe away all excess varnish that came off onto the plate, otherwise it will discolour during the baking process. Paint Clear Varnish only onto the serviette design ad again remove all excess varnish with vinegar cloth. Pre-heat oven at 150ºC and bake for 40 minutes. Heating for too long at too high a heat can discolour the varnish. Ensure that there is only varnish on the serviette and not the porcelain. The background or edge effects can be painted and decorated with a Ceramics@Home colour if you want to. Let it dry again for 24 hours before baking it.